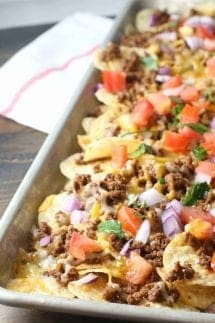 Sheet Pan Nachos - Easy Recipe for a Crowd! READY in 15 Minutes! 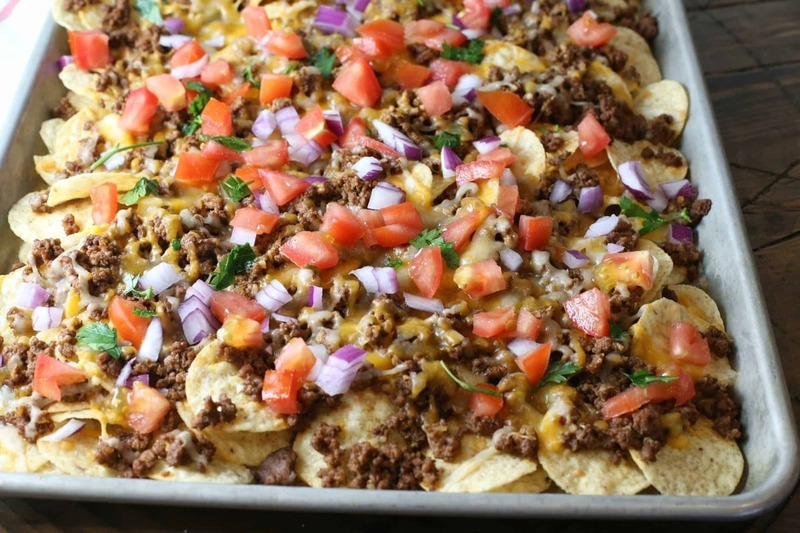 Home » Recipes » Type » Appetizers » Sheet Pan Nachos – Easy Recipe for a Crowd! Delicious ooey gooey Sheet Pan Nachos are perfectly simple enough to make for a crowd or party! You will love this one-pan dinner or appetizer! Sheet Pan Nachos are one of those super easy recipes that are great for a quick dinner. What I really adore about them is that they only take one pan, which means less clean up! They also make an easy appetizer that will feed a crowd! Why make your life more difficult when you can make this Easy Sheet Pan Nacho Recipe!! This recipe is one of our favorites to make on Friday nights or over the weekend when we have football tailgates and parties. The recipe makes a large enough quantity of nachos that you can feed a crowd! Are you always looking for one pot dinners? Be sure to take a look at this round-up of tons of great One Pot Dinner Recipes. They will surely make your life and weeknights a ton easier! Love it! Pin It to your Dinner or Appetizer Board on Pinterest and SAVE it! SCROLL DOWN FOR THE PRINTABLE RECIPE! Plus, this recipe is simple enough that you can make it exactly the way you want. If you’re a bean lover, add a can of beans to the ground beef when you’re cooking it. My boys like to drizzle ranch dressing on their nachos so we do that quite a bit. 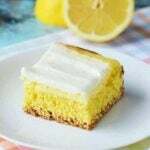 What ever your favorite is, you can add it to this recipe! There are many Friday nights that we make these as our meal! Why not?! They have veggies, meat, and cheese – everything a perfect meal MUST have! If you’re not on board with these as a meal, you should at least try them as a fun Friday night snack along with a game night or movie night! your family will love you for it! If you are looking for some other really easy appetizer recipes for a crowd, one of my personal favorites is my Baked Brie Appetizer. This is another ooey gooey delicious recipe that our friends and family beg me to make. Hint – the key is the fresh herbs! Do yourself a favor and give it a try for Thanksgiving or Christmas or for your next football party! Your guests will love it! Now, back to the reason you are here – the Sheet Pan Nachos. Scroll all the way down for the printed recipe! Anything that you love on nachos! Delicious ooey gooey Sheet Pan Nachos are perfectly simple enough to make for a crowd or party! You will love this one pan dinner or appetizer! Cook ground beef on medium heat until browned. Drain if needed. Return pan to heat and add the taco seasoning and water. Bring to a Simmer. In a sheet pan with sides, layer chips, beef mixture, and cheese. Broil on HIGH for a minute or until cheese is melty. Top with the tomatoes, onion, and cilantro before serving! Have you tried making any sheet pan meals? 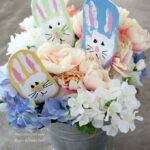 They’re a fun new trend and you can make just about anything! One of our favorites is our Sheet Pan Shrimp Bake – it’s so easy and delicious! Sheet pan nachos? Damn, you’re so creative! I would never think of preparing nachos this way. I can’t wait to try it! Made these for the superbowl. I added tomatoes, cilantro, banana peppers,black olives, black beans and onion. Put on the cheese and put under broiler til melted. Soooo yummy! I know it’s probably obvious, but I think you left out the cheese in the recipe. Looks yummy. Can’t wait to try this recipe! Crazy that you are the first person to notice this! Thank you – added the cheese into the ingredient list!